The three musicians of the Liszt -Trio Weimar are each in demand as accomplished soloists, however, chamber music has been a special emphasis of their artistic work since the time of their studies. As a Piano Trio, Andreas Lehmann, Tim Stolzenburg and Christian Wilm Müller have performed in many countries, such as Germany, Austria, Switzerland, France, Spain, Portugal, Greece, Hungary, Croatia, Finnland, Russia and Australia, since their formation in 1990. In the beginning, the Liszt-Trio Weimar were fostered by Prof.Volkmar Lehmann at the University of Music. They later attended the masterclasses of the Wiener Schubert-Trio, the Trio Fontenay (Hamburg), and the Beaux Arts Trio (New York). The ensemble has also had the opportunity to work with Prof. Eberhard Feltz (Berlin), Prof. Thomas Brandis (Berlin), and Prof. Oleg Maisenberg (Stuttgart / Vienna). Grants and scholarships have supported and honoured the artistic achievements of the Trio, including the Graduates Scholarship of the State of Thuringia (1994-95), a Grant from the Deutsche Stiftung Musikleben, and the scholarship of the Marie-Luise Imbusch Foundation (1996). The Liszt -Trio Weimar have successfully competed in National and International Competitions. At the 2nd Melbourne International Chamber Music Competition in July 1995, the Trio was one of only ten ensembles worldwide who qualified to participate. 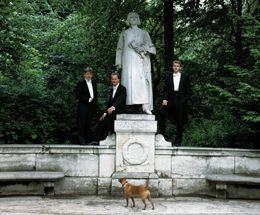 As scholarship winners of the Deutsche Musikwettbewerb 1996, the ensemble was included in the national selection for the 1997 season of Konzerte Junger Künstler. In 1997 the three young musicians won 1st prize and the Allianz - prize at the international Junge Elite Competition as part of the Mecklenburg-Vorpommern Festival, as a result opening the 1998 Mecklenburg-Vorpommern Festival with a performance of the Beethoven Triple Concerto for Violin, 'Cello, Piano and Orchestra, with the Deutsche Sinfonieorchester Berlin under the baton of V. Jurowski. The Trio, based at the Franz Liszt Centre in Liszt's Weimar residence of many years, "The Altenburg", is in many ways bound to it's namesake. The Trio members have conceived and carried out artistic and inter-disciplinary projects of the Centre, as an initiative of the University of Music FRANZ LISZT - Weimar, where all three currently teach. The Trio dedicated their first CD (1994) to the first recording of Liszt's Piano Trio Vallée d'Obermann, resulting in various radio broadcasts, both nationally and internationally.